Leaving your pet in a parked car for any amount of time could lead to heatstroke and death. In just 15 minutes an animal can sustain serious brain damage or die from heatstroke. You would never purposely leave your infant, or small child, in a car on a summer day, so why would you subject your pet to those circumstances? This week’s forecast shows temperatures as high as 85 degrees, and leaving your dog in a hot car for “just a minute” could result in heatstroke. According to a bulletin posted by PETA (People for the ethical treatment of animals), on a 78 degree day a parked car can reach temperatures of 100 degrees in minutes, and on a day when the temperature is 90 degrees, the temperature inside can reach 109 degrees in less than ten minutes. 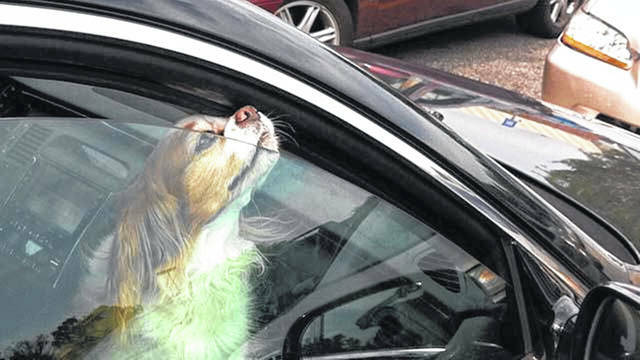 Contrary to what people might think, according to the Humane Society of the United States rolling down the windows has been shown to have little effect on the temperature inside a parked car, and leaving your pet in the vehicle with it is running and air conditioner on is still not advised. Unlike humans, dogs do not have the ability to sweat and pant to eliminate heat from the body. When faced with intense heat, panting is not enough and the animal’s body temperature rises creating a dangerous situation that could be fatal. Signs of heatstroke in animals can include heavy panting, glazed eyes, a rapid heartbeat, difficulty breathing, excessive thirst, lethargy, fever, dizziness, lack of coordination, profuse salivation, vomiting, a deep red or purple tongue, seizure, and unconsciousness. According to the Humane Society of the United States, Animals are at particular risk for heat stroke if they are very old, very young, overweight, not conditioned to prolonged exercise, or have heart or respiratory disease. Some breeds of dog, such as boxers, pugs, shih-tzus, and other dogs and cats with short muzzles, will have a much harder time breathing in extreme heat. In just the few minutes it takes to run an errand, your pet could suffer a horrific death, and you could face serious charges for animal neglect.